This is a much smaller and secluded beach with a pebbly/sand beach becoming a flat rocky platform as you go towards the sea. 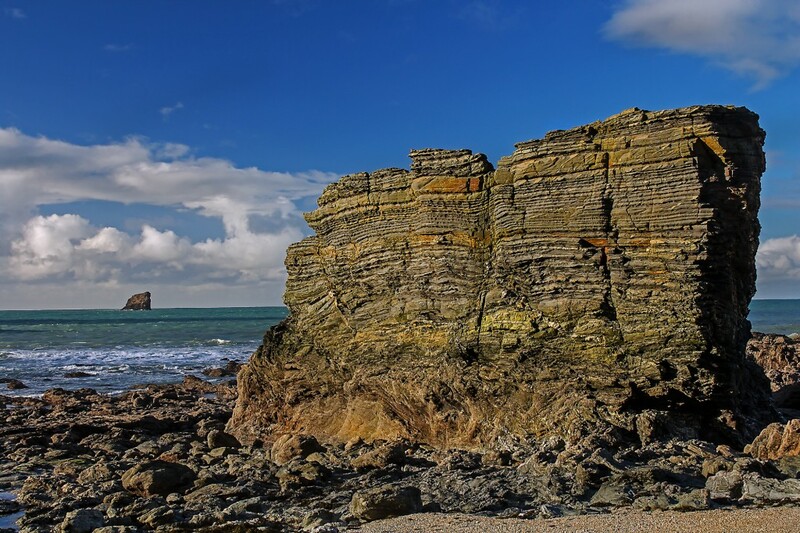 There are rocky platforms to the east and west which leads to Trevaunance Cove, and provides ideal place for rockpooling. The rocks to the east also provide a great place for fishing, but please be careful not to loose your tackle. At low tide and when the sea is flat, the snorkeling and kayaking around this cove is breathtaking. There is no lifeguard over at Trevallas Porth and mobile coverage is unreliable, so please take care and act responsibly. Parking is restricted and unsuitable for large vehicles. Just outside of St Agnes town, there’s the lovely Trevaunnance Cove. This sand and pebbly beach is fringed by a rocky platform to the east and the remains of the cove’s harbour to the west. These fringes are home to a rich variety of shore life – crabs, mussels, stalked jellyfish, nudibranche (marine slugs) and even the occasional lobster. Trevaunance is an ideal spot for watersports such as surfing, kayaking, shore diving and snorkeling. It’s possible to scramble over the rocky platform to the east and find your way to Trevellas Porth during low tide. The beach is ideal from beach angling for bass, ray, mackerel amongst others. With bars, cafes, shops and chippy Trevaunance Cove is ideal place to spend a sunny summers day or refreshing winders afternoon. There is ample parking available in the two car parks. This small beach is owned by the National Trust, has ample parking and cafe. This sandy beach is backed by a rocky paltform and large boulders but opens out to a golden sand beach. It is ideal for surfing and body boarding, with the belly boarding championships held here last year. The stunning cliff backing is home to some of the more robust shore life – like sponges, dog whelks and limpets and the pink encrusting seaweeds. All of which gives the small caves and cliffs a beautiful range of colours. At extreme low tide Chapel Porth is joined to Porthtowan Beach, however only for a very short period of time so we don’t advise walking along the beach between the two as there is nowhere to escape the incoming tide. 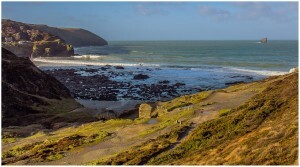 It is possible to walk from Chapel Porth to Porthtowan via the coastal path. Porthtowan beach is a popular sandy beach, which stretches over 1.5 miles at low tide with an impressive cliff backing. There’s ample parking near the beach, and a children play park and a choice of bars and cafe’s to warm up in. This beach is ideal for surfing and bodyboarding, it is covered by lifguards which also makes it a family friendly beach. On the far west end of the beach a boulder field is home to a wide variety of animals including colouful sponges, shore fish and crabs. But you have to get stuck in to find them. Cornwall Council is currently trying to regenerate the dunes in Porthtowan, currently using rows of recycled Christmas trees. Please follow the advice on the signs and keep clear of this area to help the natural grass to establish and grow. Regenerating the dunes will help reduce erosion and encourage wildlife. There are countless other beaches and coves to explore to the east towards Perranporth and Newquay as well as to the west towards Porthreath and Gwithian. So get out there and get exploring….